During the trial of the century, in a world before social media, the diverse voices of Los Angeles were captured by photographer Gregg Segal. n 1995, I was down at the L.A. Courthouse with an army of other photographers wondering why I was taking the same uninspired pictures as everyone else. What really interested me were the views of bystanders; after all, everyone had an opinion about O.J. - and I saw a means of creating a platform for this chorus of voices rising up from every corner of the city. In a flash, I pictured myself interviewing people from all over L.A., writing their opinions on sign boards and photographing them having their say. Armed with permanent markers and whiteboard, I crisscrossed the city, visiting barber shops and boxing gyms, a bowling alley and an arcade. I stopped at a Gurdwara in North Hollywood and plied a group of Punjabi Sikhs hesitant to speak out. I joined a Pentecostal service in Panorama City and elicited the views of worshippers. I went out to Catalina and stopped a pair of snorkelers as they emerged from the surf. I talked to an ice-cream vendor and a dressmaker, MTA workers and sailors and miniature golfers. Jason McCuller photographed working out at Broadway Boxing Gym, Los Angeles, April 21, 1995. Renee Cohen, a fourthth-grader visiting Los Angeles from Ohio, photographed at a miniature golf course in Burbank, March 20, 1995. Chris E. Cullins, photographed at his barbershop in Inglewood, May 15, 1995. Javier Canales photographed getting his haircut in North Hollywood, May 19, 1995. Metro transit crew photographed in Hollywood, March 17, 1995. Tommy Brown and his girlfriend photographed on the Santa Monica Pier, April 9, 1995. Rhonda and Mike Hough photographed while snorkeling on Catalina Island, May 13, 1995. Susy Sales, a Salvadoran dressmaker photographed at Sophisticated Bridal Shop in Echo Park on March 17, 1995. Steve Foulk, Grant Collins and Michael McSwain photographed on the Angeles Crest Highway, May 20, 1995. Dorothy Adams, a palm reader photographed on the Santa Monica Pier, April 9, 1995. Marvin Mattox with his son photographed at an arcade in the San Fernando Valley, March 19, 1995. A marine photographed outside his home, May 15, 1995. Vincent and Rafael Preciado photographed before church services in North Hollywood, May 14, 1995. Ronald Justin King photographed at home in Highland Park, April 15, 1995. Richard Murietta, Anthony Ramo and LeMar Brown, marines visiting Los Angeles on their way to Georgia, photographed in downtown L.A. on April 7, 1995. 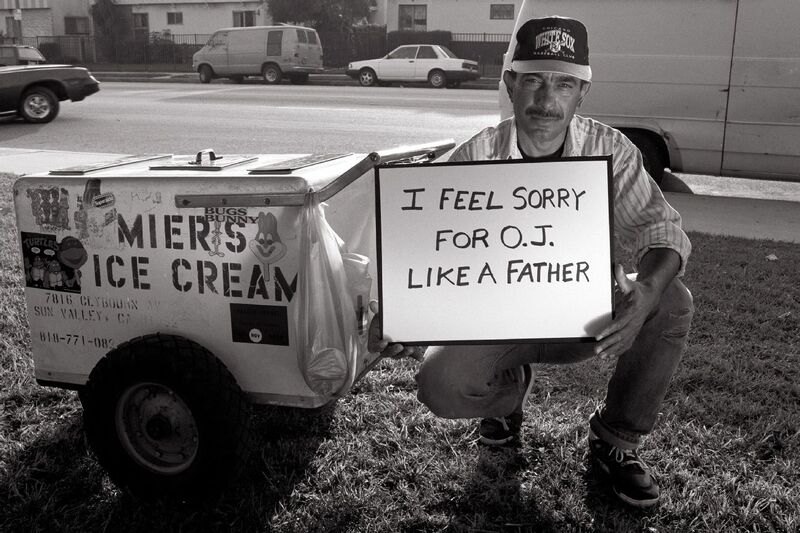 A Guatamalan ice-cream vendor photographed in Van Nuys, March 20, 1995. Heather Sizemore and Johnny Dewey photographed on Hollywood Boulevard, May 16, 1995. William E. Morrow photographed getting his shoes shined by Brennan Billups on Hollywood Boulevard, March 17, 1995. Sister Ofelia Neri photographed outside her Los Angeles convent, Guadalupanas Missionaries of the Holy Spirit, April 20, 1995. Jasbir Singh Tung photographed with two friends at the Lankershim Gurdwara, North Hollywood, May 21, 1995. Joe Leon and his family photographed at a miniature golf course in the San Fernando Valley, March 19, 1995.